Though petite, this rocky little wonder is an Estes Park area classic. 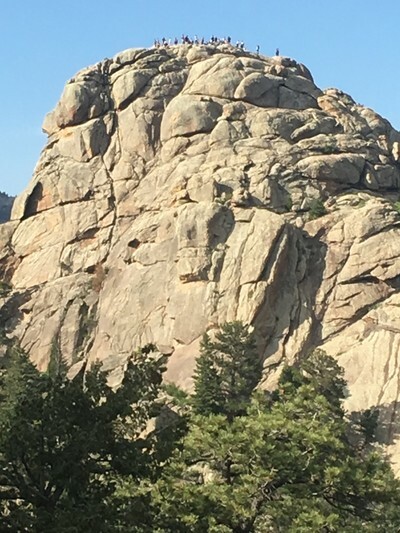 Old Man Mountain is one of the oldest and largest sacred Native American sites in Colorado for going back more than 5,000 years. It is one of only three documented Colorado "vision-quest" sites. "I just got back from a team building weekend with the company I work for. This place was AMAZING! I will start by saying I am not a fit person and I am extremely scared of heights. I had the best time ever! The staff really made this trip. They were all fantastic! Harry, Jes, Eric, TJ, Jamie and I am sure I am missing a few. They were right there guiding us, encouraging us, and ensuring we were all safe. I was able to try all sorts of things for the first time, all of which I thought I would never do! Rockclimbing, tyrolean traverse, slacklining, repealing, and a pretty intense hike that included what is called scrambling.